The Campus Chaplain is available for counseling students seeking spiritual guidance. 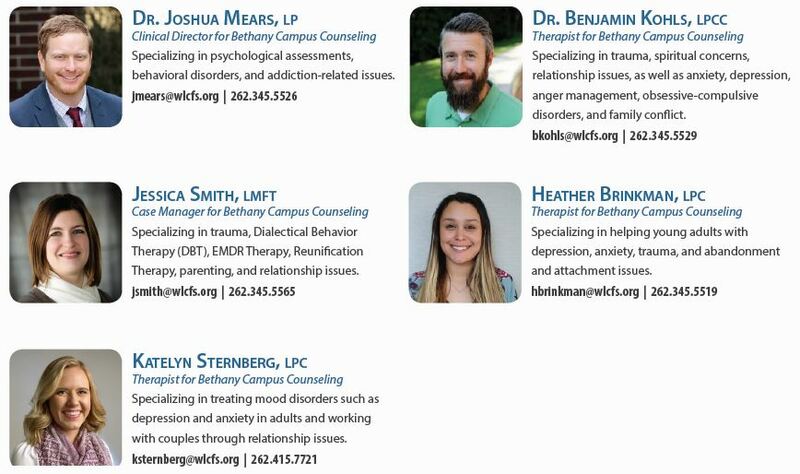 For those seeking personal counseling, Bethany Lutheran College partners with WLCFS Christian Family Solutions, who maintains an on-campus counseling center (Luther Hall 207) with scheduled office hours. WLCFS provides a wide range of counseling, assessment and psychological testing services. All of the professional mental health therapists at the BLC on-campus clinic are licensed by the state of MN. Students may continue seeing a WLCFS counselor, and they will submit claims through the student's health insurance provider. The staff at WLCFS will work with the student to determine the best options for submitting health insurance claims. WLCFS counselors are in most major insurance networks. The student can choose to continue their services with the WLCFS counselors and can pay privately with a Prompt Pay discount. This discount allows students to receive 50%-60% off the cost of all clinical services. If the Prompt Pay discount is too much for students or their families to manage, they may submit a sliding fee discount application, which can be found at www.ChristianFamilySolutions.org. Please visit with your counselor for details. Students who already have a working relationship with a counselor, may consider continuing with their current arrangement, as often a consistent and established support network proves beneficial in successfully navigating college life. APPOINTMENTS: WLCFS counselors can be requested requested online or by calling 800.438.1772. The on-campus counseling center is located in Luther Hall, Suite 207, or if you prefer, you can also meet with one of the counselors from WLCFS Christian Family Solutions at their off-campus clinic in Mankato located at 421 East Hickory Street in Suite 402. CRISIS INFORMATION / EMERGENCY: Should you have an emergency, go to your hospital emergency room or call 911. Should you need to talk to someone right away, the following crisis lines are available 24/7. Specializing in relationship issues, marriage, pre-marriage, anxiety, and trauma recovery. Experience with suicide prevention. This site provides recent mental health research information. This is the website for the organization Children and Adults with Attention/Hyperactivity Disorder. Definitions of depression and bipolar disorder, advocacy and clinical trial information. Mission to educate the public and professional communities about OCD assistance. A nonprofit, grassroots, self-help, support and advocacy organization. Helpful definitions of learning disabilities and success tips for adults with learning disabilities. Information for clients, clinicians, and researchers on many mental health concerns. Information on various treatment approaches to depression. An anonymous alcohol assessment and feedback tool for alcohol and marijuana intervention. Information on a specific medication.